The DUKE premium lifestyle brand combines absolute casualness with cool elegance. The company's values are based on its authentic fashion understanding heritage, dating back to the launch of the brand in 1966. Since then the brand has been further developed, taking influence from the latest European fashion trends, and is now a truly a pure Indian Fashion Brand with pan India & abroad presence. DUKE offers full ranges of clothing for men, women, and children. 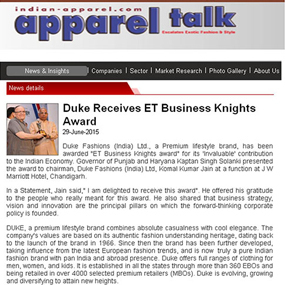 In addition, DUKE has made deep inroads into the thermal, intimate wear, accessories markets as well. Just received my order & am thrilled with everything I purchased! and the shipping was awesome it took 3 days best yet! i will shop again thanks you. Great service, Great clothes and FAST delivery!! Loved the tees, now buying more! Dreams are what drive us. Ever since our inception in 1966 we have continued to deliver innovative knitwear and fabric that have made key style statements. Creation of a unique corporate management system and culture is enabling us to develop into a conglomerate that becomes a role model of worldwide respect and trust. 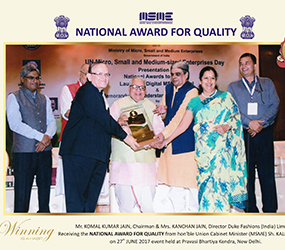 Founder of the group, Komal Kumar Jain, and his son Kuntal Raj Jain, have embraced and taken forward the principles of Total Quality Management which translates to doing "whatever it takes!" to guarantee 100% customer delight. 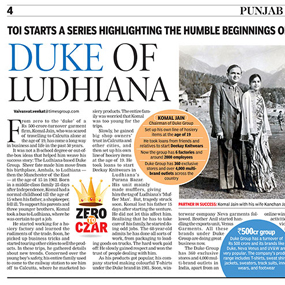 DUKE's history began when KOMAL JAIN started making t-shirts in a small setup in Ludhiana, INDIA. He quickly turned his passion for quality and design into the business of making casual wear. In 2003 his son KUNTAL RAJ JAIN joined the company and retained their father's dedication to garment craftsmanship and attention to detail. Still today, KOMAL KUMAR JAIN is the source of inspiration behind DUKE's core brand values integrity, refinement, character, understanding and optimism. Now KUNTAL RAJ JAIN the new promoter of the DUKE brand is taking on the challenge and opportunity to turn DUKE into a global brand. Today Duke embraces a complete vertically integrated garments manufacturing plan, with knitting, dyeing, processing, finishing, mercerizing, compacting, embroidery and printing under one roof Production facilities are in India. Duke Fashions (India) Limited Pioneered the T-shirts culture, and gradually established several new trends in knitting garments and fabric research. In 1998, Thermal wear were introduced for the first time in India, under the brand name "Neva", by Mr. Nirmal Jain, Younger brother of the founder. Two other group constituents – Venus Garments (India) Limited and Venus cotsyn (India) Limited, Glaze Garments (India) Limited, is headed by Mr. Anil Jain, the Youngest of the brothers. Today Mr. Kuntal Raj Jain, son of the founder, is steering the flagship brand in the new millennium. Thanks to his dynamic programs, Duke is acknowledged today as the undisputed leader, with a turnover over Rs. 240 crores. Duke is evolving, growing and diversifying to attain new heights. The key expression is cutting edge technologies and relentless quality checks by a Quality Assurance Team to achieve impeccable synergy. Our in house knitting, dyeing, mercerizing, finishing, compacting, garment printing, embroidery / printing and manufacturing facilities feature state-of-the-art machineries and equipment supplied by world class Juki, Fuku Hara, Pegasus, Yamato, Brother, Barudan, Stefab, Ramsons and others. The embroidery section is fully computerized. The knitting division is fully equipped to make single jersey, double jersey, auto stripes for ribs, fleece, velour, feeder stripes, terry and computer jacquards in diverse gauges, Our fabric choice ranges from 100% cotton to techno-blends with polyester, acrylic, linen, polymix, lyocell, viscose, modal spandex, nylon, rayon etc. Every design that we create, every contract that we accept, we execute it with the strictest regulation. No impractical designs, no cutting corners, no compromising on quality for our valued customers and vendors. Customer satisfaction begins at our drawing board. Every design is created with the need of customers foremost in our mind – we consider how they will fit our designs around their lifestyle. The Duke group produces for men, women, and children. DUKE brand is taking on the challenge and opportunity to turn DUKE into a global brand. DUKE is established in all the states of INDIA through more than 350 EBOs & being retailed in over 3000 selected premium retailers (MBOs). With the help of its exhaustive advertising and promotional campaign, the company has entered the markets of UAE, Srilanka, Nepal, Bangladesh, Jeddah etc. Moreover the products are also exclusively placed at big chain stores like Reliance, Bharti retail, Walmart India, Metro, Spar, Central, Yebhi.com, Fashion N You, Brand Factory, Coupon, Megamart, Carrefour, Jabong.com, Flipkart.com, Snapdeal.com, Myntra.com etc.The success of the Exclusive Showrooms / Factory Outlet and exports is driving the Company to new heights. Foray into Sportswear Segment, Expansion of Retail network and exploring New Export Markets are the key future plans. Duke is now diversifying into many segments. The company is now providing an endless range of product which includes, T-shirts, Jackets, Sweaters, Sweatshirts, Tracksuits, Thermals, Jogging suits, Shirts, Denims and Trousers, Lowers, Bermudas, Shorts, Value packs, Lounge wears, Accessories etc for Men, Women and Kids. Duke continues to make products that are value for money and has created loyal customers who will settle for nothing else. 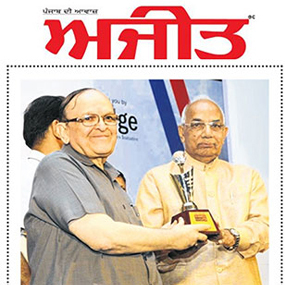 Besides strategic implementation of diverse business activities, Duke Group has always fulfilled its social responsibilities by organizing social activities like Eyes checkup camp, Dental checkup camp, blood donation camps, religious events, orphanage visits, plantation drive, fund raising for worthy charities, ESI camps, aadhar card camps etc. 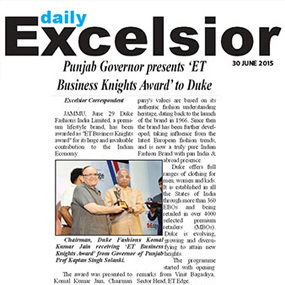 Sports activities are a regular feature at "DUKE" in order to inculcate the spirit of teamwork among its employees. Duke Group, through its innovative products, also creates awareness among its customers, employees, and all end-consumers, thereby promoting an eco-friendly environment.